One of the things I find most fascinating about the human condition is how we nearly all have common stories around food and booze, and how they are bonding tales, boasting yarns, self-deprecating stories and hilarious anecdotes. When you’re first getting to know people, you can almost guarantee that if someone orders ‘that’ bogey drink from our teenage years/the dish we can never look in the face again/shares a common childhood food habit — it’s an instant bonding moment (if you’re at all interested, mine are Martini Rosso, hard-boiled egg curry and oodles of tomato ketchup in shop-bought macaroni cheese). It’s a much easier way to find some common ground that can quickly lead to more fascinating conversation than asking someone where they’re from or what they do, because we can often not only find something to connect over — it lets people tell tales about who they are, not what they do. And it’s also a safe subject to politely argue over too. For example, if I’m sitting round a table and someone says: ”oh, I had this amazing tripe dish the other evening,” I’m the first one to beg them to stop talking about it because the very thought of tripe makes me gag. But, ironically, tripe is also attached to really good memories, because my dad used to cook up the foul-smelling stuff for our springer spaniels in the (very much detached) garage of my childhood home, and that brings back memories of how much I loved that house, those dogs, my life back then, and this is all a good thing... but I still hate the stuff. It also allows me to give people a good laugh by telling them tales of my tripe woes, as it would seem that so many of the places I go, saying to a chef: “there are very few things I won’t eat: raw tomatoes, bell peppers and tripe being basically the only three” appears to be some sort of accidental challenge. Seriously, a lot of chefs seem to think this is some sort of plea to make me like tripe because ‘they cook it properly’ or ‘it was their grandmother’s recipe’ or significantly more likely ‘because we are huge sadists and think you should eat this so we can see whether it makes you gag or not’ but the stories tend to be entertaining, albeit at my expense, and happy people around a table sharing food and drink is one of the simplest pleasures in life. Even the simplest of simple things like a pint and a pork pie down the pub with a pal can be far more life-affirming than a fancy Michelin-starred meal (not that I’m averse to one of those mind you! ), and is one of the reasons why multiple studies show that going down the local with a friend is particularly important, especially to improvements in male mental health. It’s kind of seen as a safe space to share feelings that would otherwise be deemed inappropriate by societal constructs of masculinity... but that’s a whole other topic in itself. But, as I alluded to earlier, it’s more than that — how we choose (if we are lucky enough) to eat and drink can be expressions of ourselves, how we see our place in society, how we want others to see us and, in my experience, is often a reflection of how open-minded we can be. This is not to be confused with food snobbery, such as someone not knowing what kimchi or guanciale is, but if you are someone that might try it if you come across it, we’ll probably get on. And, as with my tripe stories, it’s something that holds deep memories for people and I like tapping into those — after all, telling people’s stories is why I became a journalist in the first place, and I love hearing how something people ate or drank changed their lives in some small, or sometimes large, way. On the subject of personal stories, a lot of people are often curious as to how I got into the whole ‘cooking with beer’ idea. 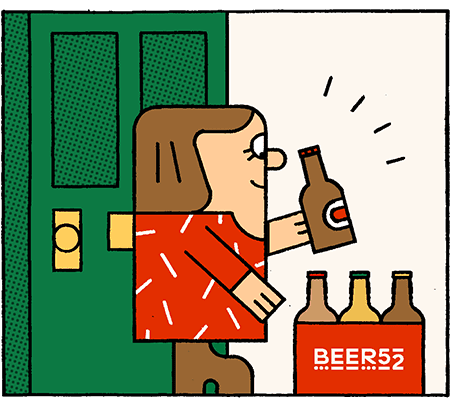 It’s a journey that has two main roads which came together about 15 years ago, to create a deep, nerdy and abiding love affair of matching beer with food — and then, a bit later on, of cooking with it too. The beer path is well documented in my first book, Let Me Tell You About Beer, released in 2011. Without re-treading too much old ground, about 18 years ago I became fed up having to wade through tired tropes about beer and descriptions like hoppy and malty, when my nose and mouth were experiencing everything from roses to roast coffee. And so, to quite some derision initially, I set about communicating what I was smelling and tasting in the beers with references to childhood sweets, nature and food. After lots of times of being told ‘this isn’t wine you know’ when the craft beer scene broke here about 15 years ago, suddenly people were sitting up and paying attention. Fortunately, when I finally got round to writing my second book The Little Book of Craft Beer in 2017, the beer world had moved on at a staggering rate and the global face of brewing had changed immensely. Not a hint was given whether you should use a lager or an ale, let alone specifying if it should be a bock or a bitter, a kolsch or a mild, and this annoyed me greatly, because the use of those varying styles will have a fundamental impact on the end dish. Then I got doubly annoyed when I turned the page of the magazine and on the next page was a recipe using wine and being really specific about which variety. Then I started scanning the pages of other food magazines I had and, at the very least, they cared enough to say “full-bodied red” or “fruity, dry white” and also, “if you wouldn’t drink it, don’t cook with it”. But when it came to beer, there was this big blind spot and ‘any old beer will do’ – naturally, I disagreed quite strongly then and I more vehemently disagree now. The main reason I disagree more strongly now is that choice is bigger than ever. Just the other day, I was doing a cooking demo with a friend who started a bit later than me in his cooking with beer adventure, but has done everything from run big BBQ festivals to restaurants with a heavy beer focus. He recounted how a few years ago he’d made a huge celebratory stew for a dinner party at home with a big American-style IPA and left it bubbling away for several hours only to be left with what could only be described as, in his words, “a god-awful bitter mess, a chaotic attempt to rescue the meat and, eventually, a pizza delivery”… and I laughed much harder than I should have because that’s what the start of my journey was like too. I would like to be honest and say that a lot of my experiments resulted in some pretty disgusting crimes against food along the way, and I have managed to repulse any number of friends and family members with the results. But, thanks to their sacrifices, patterns slowly became clear and, as theories on what happens when using diverse beer styles in different dishes were formed, the recipes have been tested rigorously over and over again, in various different ways. However, several disastrous experiments later, I decided to take a more scientific approach: how does temperature play a role? Where in the dish would that beer have the most impact? Why is there always an unpleasant flavour when I do this, that or the other? This, I feel, also reflects how a lot of us have gone through our beer journey over the years. For those of us into beer, we share stories of how our drinking has changed over time, whether it was chasing those big bitter IPAs in the early days of ‘craft’, or how a pint of good cask bitter can still make our soul sing, to that turning point when lambics went from weird to wonderful - even if we don’t all agree, we can relate, and that’s what makes the beer world a community (despite what the sceptics say). Hearing how I’ve affected people’s journeys over the years is the most joyous part of the job. I count oodles of people in my life as friends who I first met at tastings or cooking demos that I’ve held, and the way that I’ve talked about beer or cooking has sparked something in them that’s led to change. One of my favourites is a denizen of Edinburgh who only drank, in his own words, ‘bog standard lager’ until he came to a tasting of mine at a food festival, and now he sends me tweets from all over the world of him and his other half drinking new and exciting beers — and you can tell how delighted he is when he finds a brew I’ve never heard of or am dying to try. When it comes right down to it, this is the nub of what makes us human, because sharing things you enjoy or creating things for people is an act of love too; whether it’s your mum making your favourite meal because you’ve done well at school, a friend ordering a take away and laying on copious amounts of beer after a crappy break up, or your significant other making you dinner when you’ve just got off a flight from a hot country into November weather in the UK (which is why there’s ‘Ben’s Welcome Home Hotpot’ in the book). These are all small acts that show you care. Caring and community is what makes us who we are and, for me, it is where beer and food come to the fore. One of the phrases I’ve used for a number of years now is that beer is “a social lubricant,” allowing us all to rub along a little easier over the course of a few hours, and it made me think about what food does for us as a society. I’ve come to the conclusion that it is temporary social glue, holding us together against the woes of the outside world and staving off reality for a little while. And when you add the two together, it can be a recipe for perfection, and one I think we should all try to cook up for ourselves a little more. ✔︎ Do leave the room and come back in again before you serve up your food — you will get so much more pleasure from the food you’ve worked hard to cook if your senses aren’t saturated with it. Or just stick your head out the window or into a pot of scented body lotion or the like, that’ll do the trick too — ok, that’s not strictly a beer-related one, it applies to all cooking but it’s a really good bit of advice, so I thought I’d sneak it in!